As I have mentioned a time or two I was competing in the AROC 24 Hour Urban Adventure Race on the weekend just past. I have now uploaded my race report and photos. James, Marea and I had a great time, Tom and Al put on a really cool event, Dave and Julie did bloody well (no big surprise) in different teams (Dave in second place Mixed, Julie in First place Female). Fun was had. I was just sitting here wondering, I do not think I have ever seen someone use a palindromic email address, such as gro.anavs@svana.org. So there is no real point to it but I thought, for the heck of it I may as well add a palindromic email address to one of my domains. ua.di.hjs@sjh.id.au. I guess one of the reasons not to is that is harder to type/remember than a normal address such as sjh@sjh.id.au. Once again some comments on Michael Ellerman's most recent post, he is quiet correct in my opinion when he states Flat Heads Fish Cafe have the best Hamburgers in Canberra. I may be somewhat biased (due to the fact I live about 60 metres away) however they truly are a great hamburger. On the riding Mt Ainslie note, it is the fastest road descent in Canberra, largely due to the lack of corners, I have exceeded 90Kmh coming down that road from time to time and I know a few people who have passed 100Kmh on the descent. Climbing wise it is also one of the harder climbs in Canberra, it is deceptively easy at the bottom and then gets increasingly difficult and steep as you approach the top. Time wise most people will climb it in about the same time they do Black Mountain, possibly a minute or so faster. 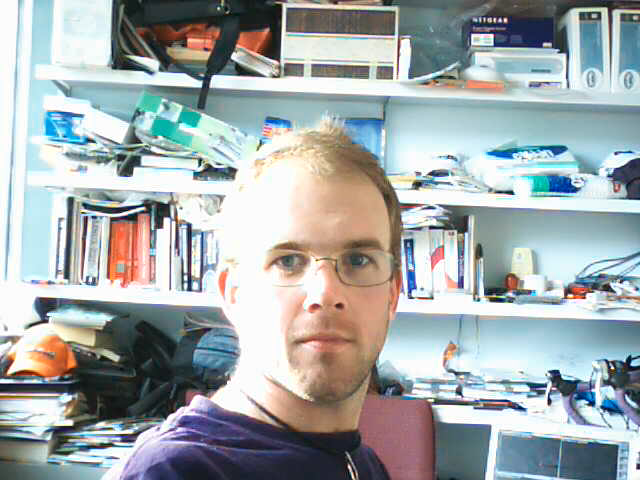 I have a webcam sitting in my office we are not using for anything else currently so I plugged it in to my desktop and took a snap shot or two. 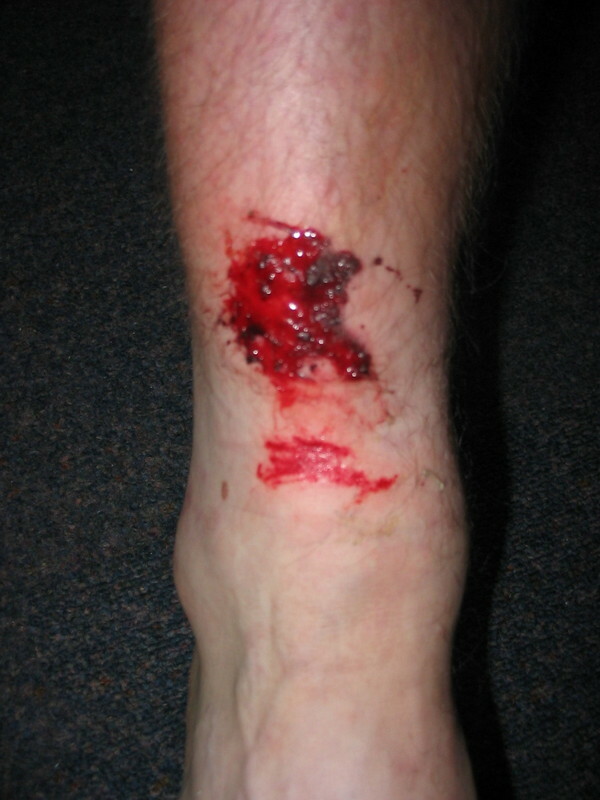 The only reason I can actually think to post these photos here is to shift the photo of my injured shin further down the page so it is not visible when you load my diary up in a large web browser window. Of course having photos of me staring back at you probably is not an improvement (though hopefully it will not force people to almost lose their breakfast as I heard the ankle photo did), them's the breaks <g>. As promised I have uploaded a report from the Sri Chinmoy Jindabyne Multisport Classic, mostly photos. The race was a lot of fun and I once again was happy to be on a team with such great people. Thanks to Bruce, Shanyn and Randall for a fun race. So after competing in the Jindabyne Multisport Classic on Sunday, as today was a public holiday in Canberra we stayed the night in Jindabyne and a few of us decided to head out for a road ride today. Obviously we were in need of a nice gentle spin to recover from the racing the previous day. So what do we decide to do? Why ride from our accommodation 6 KM on the Cooma side of Jindabyne (ie up some hills) through Jindabyne, up to Charlotte's Pass (49 Km, mostly uphill) and back. I wonder wonder if the concept of recovery has not been properly explained to us. On the other hand maybe Dave and Julie's form of recovery is rubbing off on the rest of us. After finishing XPD a few weeks ago they decided their bodies were not up to competing in the mutlisport classic solo as they both did last year, so what do they do instead, compete as a team of two of course. Oh and put in some blindingly fast times (such as Dave doing the fastest final bike leg overall). I will link to a short report and a few photos from the event once the rest of my team has seen it, Results are online already though (see the link at the top of this post). The result of a log shin interface moment (Full Size) Yesterday morning on the Friday morning ride I was riding along in the dark down a track, my lights focused on the centre of the track had not highlighted a large log poking toward the edge of the track at just above horizontal pedal height. I however was lucky enough to find the log with my right shin, damn did that hurt. I stayed up right on the bike and rode down to a more convenient stopping point. I needed to sit down until the queasy feeling in my stomach passed (about 5 minutes) but was then able to continue riding. It hurt but if I kept my foot fairly still while pedalling I was able to ride, which is fortunately still the case. I am however having trouble walking and am unable to run right now as when ever I flex my ankle in any direction it hurts a lot. I was lucky the log moved backward with the impact as I am fairly sure I would have a broken leg right now otherwise. Of course the problem with an injury is that tomorrow I will be doing all three bike legs in the Sri Chinmoy Jindabyne Multisport Classic with the rest of my triple tri team plus Shanyn's partner Randall doing the Kayak legs (Team name "Don't Nobody Move" (another Ani inspired name)). For this I should be able to compete as hopefully there will not be much walking involved in any of the bike legs anywhere (unlike the triple tri which does have some walky sections) and I do not need to run. Right now I just have to hope I heal reasonably fast as next weekend I am competing in the AROC 24 Hour Urban Adventure Race (team of three with Marea England and James Gardner). This event will have significant amounts of running and a heap of other stuff, I just hope my shin has healed and the swelling gone down to the extent I can run well enough by then. I just got back from a post work ride (though I am back in the office doing some work, ahh well). Sue and I (there was supposed to be one other person however they mysteriously piked) went and did two Stromlo repeats and then a climb of Black Mountain upon our return to this area. We had intended to go around Cotter/Uriarra however the wind is blowing heavily in Canberra right now and we did not think the loop would be pleasant in this wind. We also originally planned to do two Black Mountain reps upon returning however it is getting darker and I felt the need to get back to the office so I talked Sue out of the second Black Mountain. I was somewhat surprised how well I climbed today, the first Stromlo climb (in the howling wind) felt slow and I did not see my speed sit much above 20 anywhere on the climb however I found when I got the top I had done a 12:10. Next climb I was setting a reasonable (though not full on) pace and then my phone rang with Bob asking something about a computer at work, so I chatted with him briefly. At half way they had put the boom gates down so I had to pull up almost to a stop and go around it on the gravel (on the descent the boom can be ridden around easily as it is shorter, however it goes all the way across on the left hand side of the road). After those two things slowing me down I though, ahh what the heck I may as well put some effort in and attempt to regain time so I put the bike up a gear and started spinning along up the climb at 24 and 25 constantly for the rest of the way. Surprisingly when I got to the top I had done the climb in 11:20. We rode back toward town with Black Mountain looming in front of us, the ride down Cotter Road was brilliant with the strong tail wind we could do 60KMh effortlessly, feeling like pro cyclists for a few minutes. Then turning up Black Mountain I took the bottom steeper section slower at around 11Kmh the whole way, past the reservoir I decided to simply keep it steady siting around 12KMh. I seemed to be on track for a comfortable 13 minute climb. I guess I stopped paying attention at the flat bit and somehow at the top had sped up enough to do a 12 minute climb. Where the hell did that come from? Oh well I guess it is nice to be pleasantly surprised by ones form from time to time. Long Horizontal Dropouts and Disc tabs (Full Size) The rather nice Diamond Back Ascent Steel Hard Tail frame I got back in January would have been great as a touring bike or plan hard tail (so long as I was happy to use V Brakes) however as I intend to use it as a single speed I needed to get slightly longer dropouts on the frame so as to avoid the need for a chain tensioning device. Before I left for my recent New Zealand trip I dropped the frame off for Wayne Kotzur to do some modifications. I have previously been most impressed and happy with the work Wayne has done on some of my other frames (he also repaired the broken Apollo Road bike frame, I simply have not photographed the fix). On the new single speed frame I asked Wayne to add longer horizontal drop outs, and just in case I ever choose to use the bike as a normal mountain bike, or if for some reason I want to try it on the single speed, I asked him to add disc tabs (and a support brace) to the rear triangle so I can use discs if I ever choose to. It comes as no surprise that Wayne did some lovely work with the modifications, as can be seen in the photo the the left. 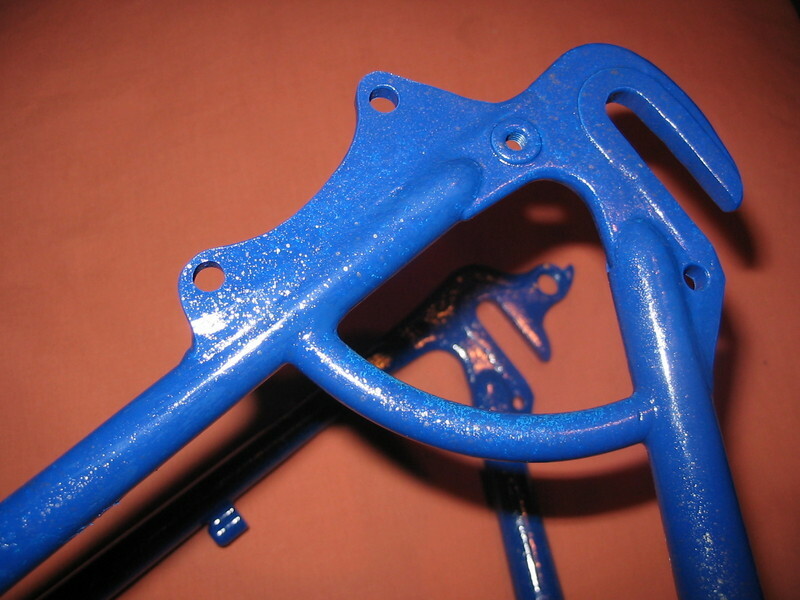 He even did a great job with the colour matching of the paint with midnight blue paint over the undercoat he applied then gold paint speckled on over that to appear similar to the rest of the frame. Once again the cost was remarkably low, AUD $143 for all of it including labour. I noticed this a few weeks ago, however I am still attempting to get my head around it. At the local supermarket they sell 600 ml bottles of pepsi max and 1.25 litre bottles of pepsi max. Both bottles are chilled (in the same fridge unit), the 600 ml bottles cost AUD $2.60, the 1.25 litre bottles cost AUD $2.25. Did the people who set these prices have marketing lessons from the Underpants Gnomes or something? I do not understand. Polaris for Dummies Jersey (Full Size) As I explained in my 2006 Polaris Challenge report, Marea and I had some custom jerseys made for the event this year. 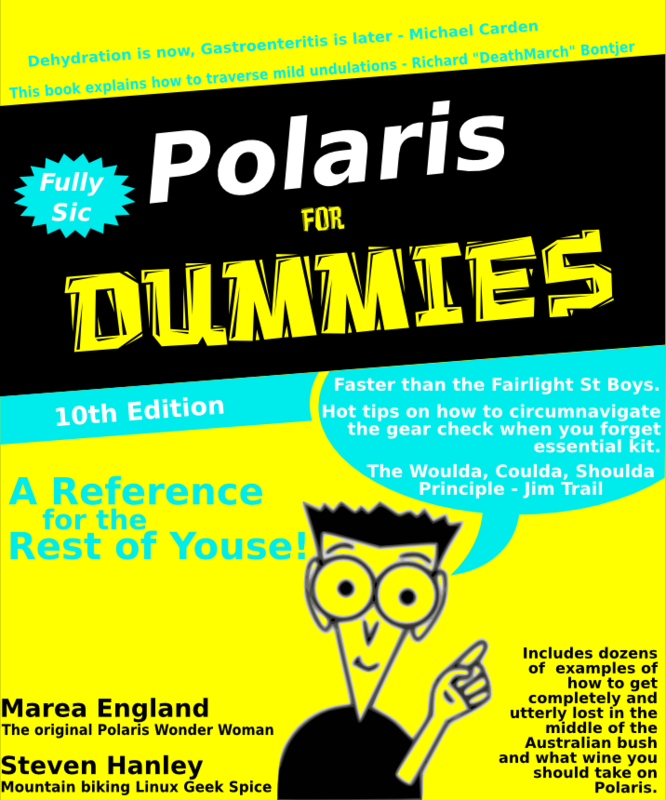 Modelled off the Dummies books, we basically put a whole bunch of in jokes on it, Richard Bontjer, Michael Carden and Jim Trail quotes, a reference to the Fairlight St Boys who Marea always wishes to beat in Polaris and others. I have a png of the book cover artwork online if you wish to be able to read all the text easily. Hmmm, I notice Michael Ellerman has been doing some black mountain climbs. I feel the need to correct his data somewhat. I climb black mountain sometimes, usually I do three repeats (climb it three times in a row) often in winter I head out there on Tuesday morning for three reps as there is no Cotter/Uriarra loop through the middle of winter. Also I do it after work or at lunch time a bit as it is handy to ANU. My fastest time up the climb is close to 11 minutes, I tend to do repeats between 12 minutes and 13 minutes three climbs in a row. I am by no means a fast or strong climber. Dave Moten for example holds what is the current observed fastest climb of black mountain, I was riding repeats with him the day he did this climb too, he and Simon disappeared in front of me, and this was the third climb in a row Dave had done that lunch time, he did one at my speed (ie slowly) to start off, then he did a climb out of the saddle the whole way, next he decided to try and do a fast climb. Which as you can see above, he did. 8 Minutes 44 Seconds is absolutely flying up there. On that list you may note the second name (9m15s) is Stephen Hodge, an ex European pro cyclist who has ridden in the Tour de France a number of times. Dave Moten comes out on road rides with me fairly often and I can tell you that man is a damn impressive climber. I seem to recall the Commonwealth Bank Cycle Classic finished a stage from Goulburn to Canberra one year climbing up Black Mountain, I thought the times for the lead bunch were under 8 minutes however I was young and my memory may be deceiving me. How I escaped is almost beyond me, today I went to the club night at the Mont Factory Sale. This, in my opinion, is the most dangerous sale of the year, incredibly large amounts of great outdoor equipment at really low prices. Every year Mont holds this factory sale, around this time of year (generally it is the weekend before Polaris), Thursday evening is the clubs night, so members of cycling, triathlon, rogaining, and other outdoor clubs can attend the sale. Then Friday, Saturday and Sunday it is open to the general public, however there is a lot of stock they rotate or bring out of the ware house to the factory floor through the weekend so being in there first does not mean those there later will miss out. Although I would love to buy, oh I don't know, one of everything they make almost, I went in with the objective of replacing my wind proof vest with a Mont Zing Vest. For the last 4 months the Netti wind proof vest I bought when mine went missing after Gary Rolfe wore it when he broke his arm has been starting to fail. Mostly the zip has been problematic, however as I never liked this vest a whole lot I am happy now to have the chance to put it into the cycle gear pile and not use it much. 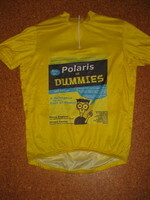 I bought myself a lovely bright orange Zing Vest then as I was about to walk out of the sale I saw Cargo Bags for sale, 90L bags for AUD $49, too good to pass up as I have no large gear bag to carry all my stuff I need to races in one bag and generally end up with a few smaller packs. They had other sizes however I thought the 120L bag was too big for what I need and the smaller bags are similar to some of my packs. I guess the only reason I escaped the sale with only two items was I was only buying what I absolutely needed and not stuff that looked nice. There is always next year I suppose. I saw Hugh at the sale (among many others who do not have blogs so can not be linked to) and I was impressed he was also able to control the urge to buy all that lovely equipment and walked away with only two purchases. I saw others walking out with arms piled high so not everyone was able to escape so easily. At least for me I have the Polaris this weekend so I will be able to better resist the urge to return to the sale and buy more due to being out of town. 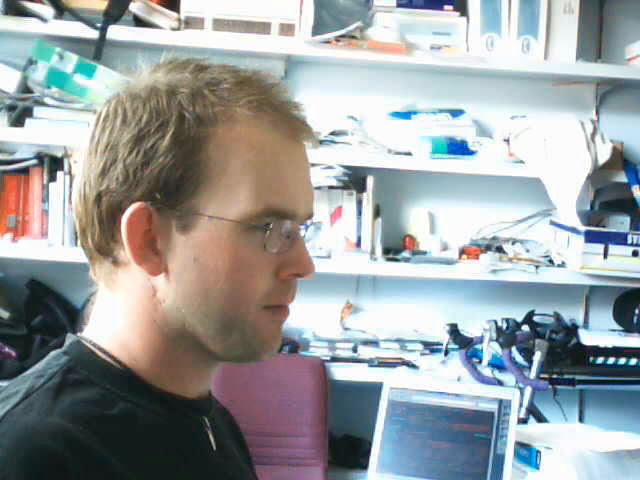 So I spent a while today at work mucking around with some web cams we bought cheaply. They used the spca5xx driver which is apparently based on the old ov511 code. One of the two (and IMO the nicer camera) is the remarkably cheap Logitech Quickcam for Notebooks, it looks like some small flying saucer side on. Once the spca5xx driver was installed I was able to use gqcam and pan around the office and wander around with a laptop attached watching the video. I can kind of understand why there would be fun aspects to Mikal's PhD research, mucking about with imaging and output quality of these things among other topics. I guess I was having more fun with this one as I was setting it up to be used for something other than a security monitor which is what we use a few other cameras around the department for. Clearing a few links out of the to blog file once more. On Metafilter the other week was this link to a set of tables and links that enable you to find out what song was number one in the US Charts back to 1940, using the billboard magazine data. This is neat (though completely irrelevant information) for example you can find out what the number one song was (yeah in a different country) on your birthday easily. For me it was "MacArthur Park" by Donna Summer, which and who I have never heard of, at least my sister gets a rather neat song of which I have heard "Another Brick in the Wall" by Pink Floyd. I think this one was from Metafilter also, a blog someone is writing with 6 thousand people you should meet before you die, some interesting looking people there, a lot of them are academics but I personally think that is valid, smart people really are interesting. Danah Boyd had a link to Cute Overload the other day which is pretty much what it sounds like based on photos of animals. Kind of like 1000 unicorn posts in one website. Gee the US School system lives up to all the bad reports we hear about it (from Metafilter), it scares me that our government seems keen to make schooling in Australia worse all the time also. On the note of US schooling I have a story I found the link to on Feb 21st last year (from Joe Shaw's diary on Planet GNOME) detailing the quagmire into which US Text Book production has sunk, although we (Australia) do not have quite the ridiculous amount of religious crap to get around in schooling I suspect our text books are not really a whole heap better. From December 1st last year, Kottke had a link to a New Yorker article about different working patterns in Europe compared with the US and what the causes and outcomes were/are. Interesting (though not surprising IMO) that Europe's more relaxed attitude appears to be more beneficial. I am sure everyone has seen this story by now (I got the link on November 18th from BoingBoing) however it needs to be written about as it is damn cool. A scientist worked for years on one of the holy grails of toys and similar and finally was able to produce coloured blowing bubbles that do not leave permanent stains and have the colour evenly spread over the bubble. Damn I want some when are they going to market. For another kottke link (from Nov 2nd) this is a mcsweeneys list of responsible spam messages. From Metafilter again, a list of (from Sep 30) useful google tips, many of which should make you far more effective at using the search engine.